The Apple ecosystem has no shortage of ways to share files. There are countless apps and services that aim to make this as easy as possible. With a lot of the articles we write here at The Sweet Setup, we are comparing apps and services that are virtually identical outside of user interface. With this category, that is not the case. These apps, while appearing similar, all have a different focus. With a plethora of options, what is our favorite cloud service/app for file sharing? With an incredible feature set, active development, and a sustainable business model, Droplr is our favorite way to share files, make simple annotations, and track links. These must do enough to warrant being installed as well as the purchase price. We expect apps in this category to create shareable links automatically, create links that are able to handle substantial amounts of traffic, and ideally give some sort of analytical data about the number of times a shared item is viewed. Nothing is more frustrating than an app that is supposed to make something easy, but misses the mark. These apps are designed to make sharing files easy, so missing this makes it dead on arrival. Apps in this category should be well-integrated into Apple’s ecosystem. While $5 a month here and $2 there doesn’t seem like much, it does add up. Should these apps be a one-time purchase or have a monthly fee? Do they do enough to justify the fee? Do they fit in with latest design trends of iOS and macOS? Do they take advantage of the latest features? Do they work on macOS, web and iOS? Is the experience the same across all of them? So at the core, what is Droplr? Droplr is about sharing images. It’s right there on the front of their homepage. While that is the main feature, it can really share anything. Almost any type of file can be uploaded and shared through Droplr. It has built-in screenshot annotation on the Mac. You can also type text notes right into Droplr, and you can share links (allowing for custom URL branding). Using Droplr is incredibly easy. On the Mac, it lives in the menu bar and gives you one-click access to all of its options. Clicking the menu bar icon shows you a list of your most recent “drops.” You can also quickly upload files and screen recordings, take screenshots, and record reaction GIFs all from there. Droplr allows you to set keyboard shortcuts so you can interact with it without taking your hands off the keyboard, but you can also drag and drop files on top of the menu bar icon for fast uploading. I’m a really big fan of the simple screenshot annotation as well. I use this for those times when I just need to quickly fire off something. If you’re a mouse-heavy user, you’ll appreciate the Share with Droplr option that is added to macOS’s services menu after the app is installed. Droplr’s “create a note” feature is aimed at anyone from the programmer, a writer using Markdown, or someone wanting to share a Christmas list. If you paste a paragraph with Markdown in it, the public link will actually render the Markdown into rich text. The owner of the drop can also edit the text on Droplr’s website. It even displays smart syntax highlighting and line numbers. Is it a true Markdown editor and code snippet manager? Not even close; but it’s highly useful for quick sharing. Droplr also has a great Pro feature that I use often: self destructing drops. Most of what I am using Droplr for is quick shares, and it never has the master copy of a file. Being able to have those automatically disappear in a day or a week is fantastic. This makes for a great security feature with content that you want to disappear. While this was certainly possible to do with Hazel or a Reminders notification and a manual delete, it’s nice to have it automated. Do you need to send a quick link to your W9? This would be a great way to make sure the link disappears within the hour. Design-wise, Droplr is great. It strikes a nice balance between minimal and highly useful. One tap on the Mac menu bar icon and you can see your most recent links along with your click count on those. My main complaint would be that I want a way to see all of my drops without having to visit the website. Droplr offers three plans: Lite, Pro, and Enterprise. The Lite plan offers 10 drops a month, 5GB of bandwidth, and 1GB total storage. If you just occasionally share a few files using Droplr, then the free service might work well. It is missing the self destruct option, ability to password protect files, and the annotations feature. If those features are important to you, the Pro version is what you need. The Pro version includes everything from the free version along with unlimited drops, 50GB of bandwidth, and 10GB of storage. This maxes out at five users and is the best fit for most Droplr users. You can find pricing information for the Pro plan on the Droplr website. The Enterprise edition is for folks who need to centrally manage large teams. No pricing is mentioned on the website, so you’ll have to contact their sales staff for more information. The business edition also includes custom branding, single sign-on support, third-party integrations, and much more. Droplr is an app that is focused. Its goal is to make sharing files easy. All of the apps have been updated for the current OS on each platform, so it’s a product that is constantly being maintained. CloudApp is another Droplr-like service that has been around for a number of years. 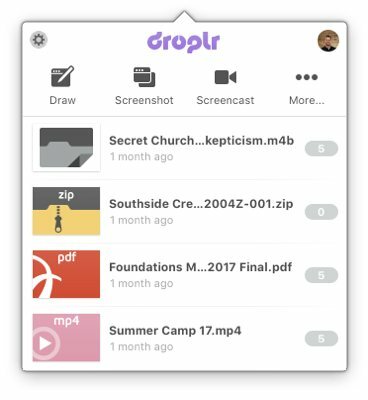 Like Droplr, its goal is to remove friction from sharing files online, and works with screenshots, screen recordings, and URLs. It also lives in the Mac menu bar, where you can drag and drop files, which generates links that are automatically copied to your clipboard, just like Droplr. On the surface, CloudApp and Droplr look exactly the same, but CloudApp is missing a few features that tip the scales toward Droplr. The first is the inability to compose notes directly into the interface. While this might seem like a trivial feature, it actually adds quite a few steps to sharing text. With CloudApp, I have to open a text editor, write, save, and then upload that file to CloudApp. In Droplr, I can simply compose a new note right into the app. Another area that CloudApp struggles with is iOS. While there used to be an official iOS app, it is nowhere to be found on the App Store. There are several companion apps made by unaffiliated developers, but the lack of an official app is disheartening. Finally, the Pro tier of Droplr is quite a bit cheaper than CloudApp. While price isn’t always the most important factor, it does tip the scales even further in favor of Droplr. Dropbox is well-known in the Apple community. It’s been the de facto file syncing service for a few years now. It’s well-integrated into a ton of iOS apps and the Mac, it supports file sharing, automatic screenshot importing, and you probably already have it installed on your Mac. Why wouldn’t we just use this and get rid of Droplr? At the end of the day, you can pretty much do everything in Dropbox that you can in Droplr. The Dropbox app can automatically import (and copy the link to your clipboard) your screenshots taken with the built-in keyboard shortcuts (CMD+SHIFT+3 or CMD+SHIFT+4). Dropbox can sync pretty much any file you can throw at it as well. Sharing options are built right into the Mac contextual menu, and while it’s possible to do everything Droplr does in Dropbox, it’s just not as fast. Annotating a quick typo on a website in Droplr is dramatically faster than taking a screenshot, editing it in something like Preview, and then uploading it to Dropbox. Droplr files are not stored locally, so it doesn’t take up precious hard drive (or SSD) space. I also really like the ability to drag and drop files onto a menu bar icon, which Dropbox doesn’t do. You must first drop the file you want to share in the Dropbox folder in Finder, right-click it to get a link to share, and then send it somewhere. 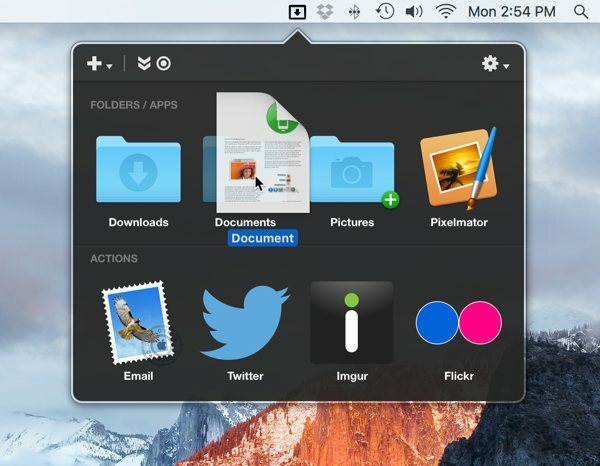 In Droplr, you drop the file on the icon and a shareable link is copied to your clipboard. While that doesn’t sound like a lot, if you do it 15-20 times a day, it saves a lot of time. Similarly on iOS, Dropbox is not designed for quick file sharing. While you can share everything but links, it takes more steps. You have to upload and copy a shareable link. With Droplr, uploads are immediately copied to your clipboard. Apart from Droplr, CloudApp, and Dropbox, there were several other apps that met our criteria for cloud file sharing services, but didn’t make the cut as the top performers. GrabBox is a Mac app that grabs your screenshots, copies them to your Dropbox Public folder, and copies the link to your clipboard. 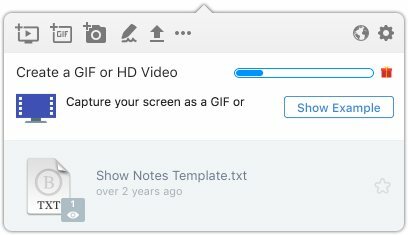 Before Dropbox offered this feature, this would have been nice, but I’m not sure why using this over the built-in Dropbox tools would be necessary. Dropzone is a Mac menu bar app that allows you to upload files to FTP, S3, Imgur, Twitter, Flickr, etc. It’s well-maintained and has 4.5 stars on the App Store. Dropzone is the ideal app if you want to control every bit of your data. You could essentially build a Droplr-like file sharing service using S3 or your own FTP server. It’s a great app, and it does a whole lot more than just simple file uploading. Shawn Blanc had a nice write up about it a few years ago. As a file sharing app, is Dropzone better than Droplr? Droplr is still the fastest and easiest ways to share files. Features like self-destructing files, built-in annotations, link sharing, and a built-in note composer set Droplr apart. If you want your shared files on storage you control, Dropzone is the best option out there. Dropshare is similar to Dropzone in that it lives in the Menu Bar on the Mac and works with various external services, such as Amazon S3, Rackspace Cloud Files, or your own server (SCP over SSH). Like other services, it works with text documents (can convert Markdown to HTML), screenshots, and other types of files. It also has built-in screen recording (full screen and selection-based). Overall, It’s really a powerful app. Like Droplr, you simply drag a file to the Menu Bar icon and it handles the rest. An iOS version is also available. While it’s mainly a stripped down version of the Mac app, it does have a native sharing extension, which allows you to upload from any iOS app that has a native share sheet. Dropshare is becoming a really powerful ecosystem, but it does require the use of external services in order to use it. If you want to use your own solution using S3 or Rackspace, Dropshare is the way to go. With an iOS and Mac app, it is an ecosystem that can go with you anywhere. Droplr is still our favorite because it’s a turn key solution. You sign up, download, and start sharing — no other services to configure. Like Dropzone, Transmit is a great solution for building your own system and owning your data. Transmit has a feature called “Droplets” that allows you to make an icon (even on the Dock) to drop files onto. It will then upload that file to whatever destination that Droplet is configured to upload to (your S3 bucket in a certain folder, etc). While this is extremely helpful for uploading files to a client website, it’s not so useful for quick file sharing. For example, the URL is not automatically copied to your clipboard. You could either build a TextExpander snippet to generate it automatically, or you could launch Transmit and get the URL by right-clicking the file. With the retraction ofTransmit for iOS, it’s just not as simple as using a dedicated tool like Droplr. 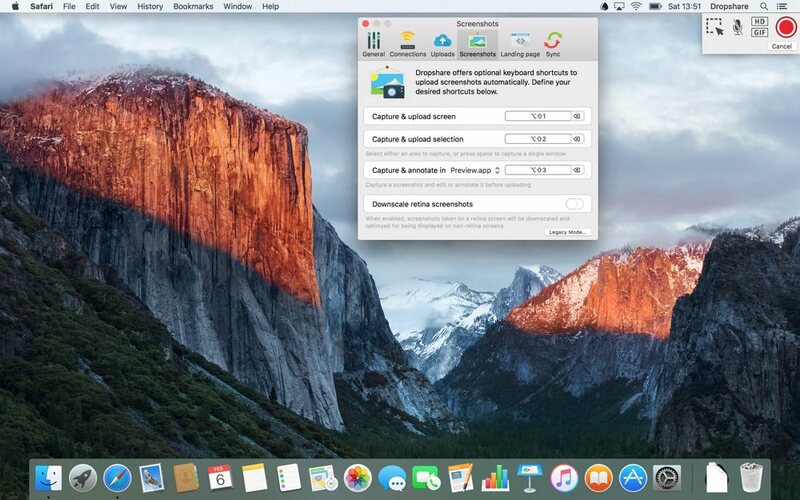 iCloud Mail Drop was a new feature with Yosemite. It allows you to send email attachments (up to 5 GB, which doesn’t count against your iCloud storage quota) to someone regardless of what email provider they use. While this is an awesome feature, it’s not built for simple file sharing. This requires you to actually send someone an email. This wouldn’t work for Twitter, iMessage, Slack, etc. While Mail.app on Yosemite also supports image annotations, it’s still not an apples-to-apples competitor to Droplr. There is no way to manage files or upload new files to it on iOS, either. Works seamlessly with non-iCloud email accounts. 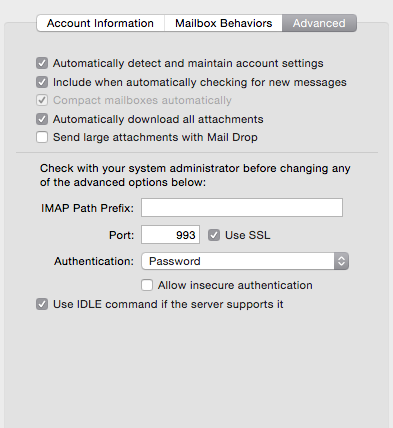 Works with non Mail.app users (they will see a URL to download). Files stay active for 30 days and then disappear. As I mentioned earlier, there’s no shortage of file sharing applications in the Apple ecosystem. 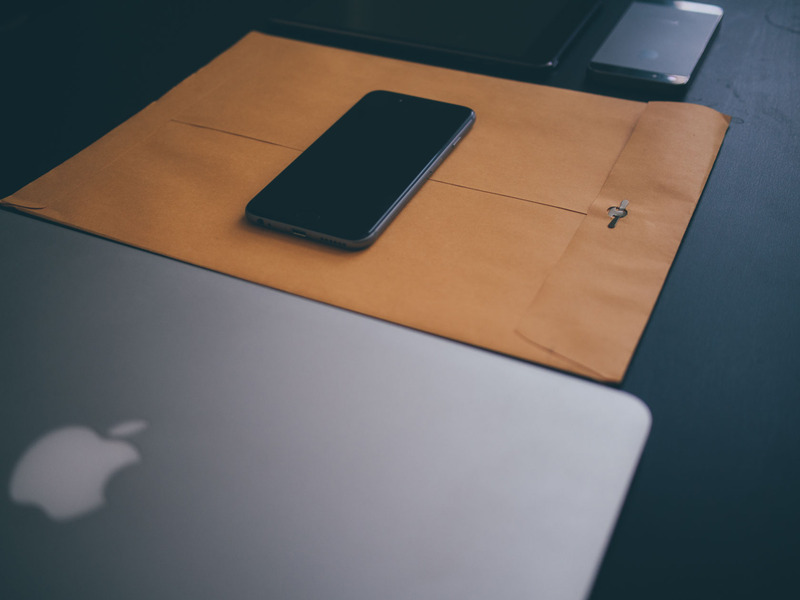 While Dropbox is probably installed on the Macs of most people reading this article, Droplr is our favorite for cloud file sharing. 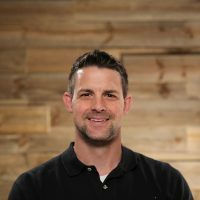 It’s not that we don’t love Dropbox, because we do, but it is that Droplr is laser-focused on allowing its customers to share files. It doesn’t want to be a folder that syncs. It’s a utility app that uploads your files, gives you a link, and disappears. With that being the goal, they’ve nailed it.